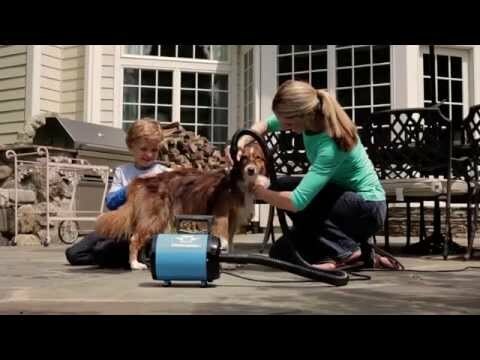 The MetroVac Air Force® Commander® Color Pet Dryer features all-steel construction and is so powerful, you'll forget it's portable! This two-speed dryer combines an air concentrator, air flare tool, and a groomer rake all in one compact unit. It's easy to operate and strong enough to dry heavy-coated dog breeds, making it ideal for professional groomers and pet owners alike. It' nice to use such a quality American made product. This is my second one; the first one lasted about 20 years. Same price as other merchants, but free shipping is why I chose you guys. I KNOW THIS IS A VERY FAST DRYING BLOWER. HAD ONE PREVIOUS. GAVE IT TO A FRIEND. I HAVE THE ORANGE ONE, MISS THIS ONE. FINALLY BUYING FASTER, STRONGER DRYER. My corgies shed like crazy but this makes grooming faster and easier for all of us! Does this dryer blow hot air? BEST ANSWER: I find the dryer very useful. As I have a porteguese water dog and the hot air is great here in Oregon. After a bath or just to help fluff. You will find many uses for it. Drying your hair is a plus also. The air warms by blowing over the motor; therefore there is no danger of it getting too hot. I have used Metro for over 20 years. Finally had to replace my original one....Good equipment. NO, BUT THE LONGER YOU USE IT, THE MOTOR DOES HEAT THE AIR COMING THROUGH IT. Yes, it does blow warm air.